He also publishes the Let’s Talk Motivation! newsletter which provides a source of ongoing motivation to his readers. Josh has been a student of personal development since the age of 15 years old when he read his first book by Speaking legend, Zig Ziglar. 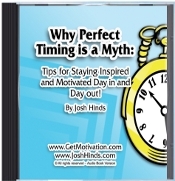 * To learn more about having Josh Hinds speak at your next event, seminar, or company meeting go here. The section of the site you’re on now is where I include many of the original articles that I’ve written over the years. You are welcome to share and use any of my articles in your publications, magazines, newsletters, newspapers, ezines, or web sites (please only use the articles which I have written – not those of other authors or speakers which may appear here). -It’s your life, LIVE BIG!